Benjamin Netanyahu is losing his re-election: The Israeli prime minister has no one but himself to blame. Benjamin Netanyahu has botched his re-election the same way he has botched everything else. Prime Minister Benjamin Netanyahu delivers a campaign speech to his supporters in Netanya, Israel, on March 11, 2015. Israel’s prime minister, Benjamin Netanyahu, is going out with a bang. Trailing in polls four days before Israel’s parliamentary election, he’s shedding his pretense of friendly relations with the United States. Finishing second next Tuesday won’t, by itself, destroy Netanyahu’s career. But the manner in which he’s doing it has made him toxic. His days as a credible representative of his country are over. Netanyahu has blamed “European states” for some of his election troubles. Until recently, he had left the most explicit America-bashing to surrogates such as his intelligence minister, who warned Israelis on Tuesday of a “mobilization … by elements in the United States against us.” But in the last two days, Netanyahu has sharpened his attacks. In an interview with the Jerusalem Post on Thursday, he accused his rivals of suggesting that “we should bow our heads to the U.S.” Under his own leadership, Netanyahu pledged, “The days when Jews bow their heads are over.” He argued that an Israeli prime minister must “draw the line” not only against Iran’s nuclear program, but also against dividing Jerusalem and withdrawing to Israel’s pre-1967 borders. When Netanyahu addressed Congress on March 3, he swore his trip wasn’t political. “I deeply regret that some perceive my being here as political,” he told the assembled lawmakers. “That was never my intention.” But on Thursday, Likud released a commercial that shows the prime minister receiving a standing ovation in the House chamber. Think about that. First, Netanyahu accepted a unilateral invitation from congressional Republicans. Then he ignored signals from the White House not to come. He stood on the floor of the House of Representatives and urged Congress to oppose the Obama administration’s foreign policy. He lamented, in a tone of wounded piety, the notion that anyone might think his speech was political. Hundreds of lawmakers, taking him at his word, stood and applauded. And then Netanyahu used their applause in a campaign ad. There is no greater chutzpah. It turns out that when you go to the capital of your most important ally and slap its president in the face—particularly when that ally is the only friend standing between your country and near-total international isolation—your own people don’t necessarily conclude that you’re a hero. Many of them conclude that you’re a jerk, a fool, and a hazard. In a poll released Tuesday, 49 percent of Israeli Jews said the U.S. would be less friendly to a government led by Netanyahu than to a government led by his rivals. Only 7 percent said the opposite. When Jewish Israelis were asked which head of state was responsible for frayed relations with the United States, only 32 percent blamed Obama. Twenty-seven percent blamed their own prime minister. Maybe Netanyahu is right. Maybe the whole world is out to get him. But if that’s true, it’s not because he’s brave or righteous. It’s because he has gone out of his way to antagonize so many people. Obama is just another leader he couldn’t get along with. Among heads of state, rolling your eyes at Netanyahu has become a bonding experience. Netanyahu thinks his behavior earns him “respect.” He has invincible faith in his ability to outtalk, outmaneuver, and impose his will on others. That’s why Israel is holding this election. 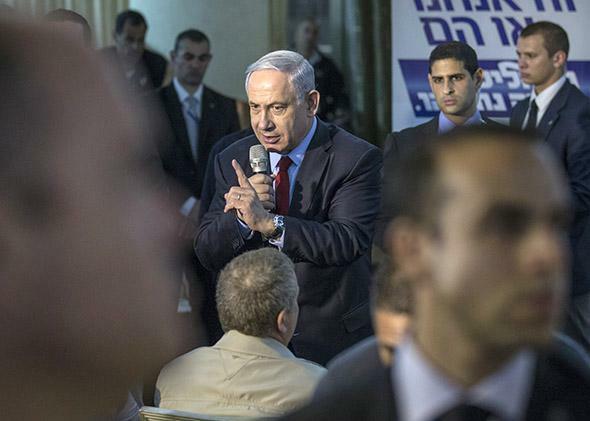 In December, Netanyahu fired the ministers whose parties were propping up his government. He thought he could win without these partners. He would just tell Israelis what’s what, and they’d sweep him back into power with an incontestable mandate. Today, as Likud stumbles toward a second-place showing that will force it to bargain with other parties for the chance to form a government, Netanyahu refuses to compromise. His rivals are willing to share the prime minister’s office, but he isn’t. “I won’t rotate the premiership,” he says. Of course not. Netanyahu is botching the election the same way he botched Israel’s leverage in the Iran deal, its relations with the United States, and everything else. He commandeers the stage, insults his allies, and refuses to shut up. That’s who he is. And that’s who he’ll still be a year or two from now. But he won’t be prime minister of Israel.